For some time now Adare Manor has always been on the ever growing must visit list. Only 2 and a half hours outside Dublin, Adare village is a stunningly pretty escape from the the hustle and bustle of any city, with some fine restaurants such as Adare 1826 among others and an abundance of little boutiques. As soon as you approach the gates of the impressive manor you realise this will be an experience to remember. Surrounded by an award winning golf course and carefully landscaped grounds, the drive up to the house itself allows you to take in the natural beauty that is everywhere to be seen. A stay in such a historical and fine building such as this is something special to say the least, we were celebrating a birthday and cannot think of a better place we could have chosen. From the second you set foot through the impressive doors you are greeted with a warmth and charm that is one of the reasons so many overseas visitors love this location. We were fortunate to be staying in the old building dating back to the 1800’s, the rooms have been meticulously restored, retaining all their period elegance and yet they house all the mod cons you may require. The views from this side of the building are truly breath taking, overlooking the River Maigue, where in season you can catch your own trout or salmon and the kitchen will be more than happy to cook it for you! From the bathroom of our suite to the backdrop of the 18th hole and beyond, it is clear to see why this course it tipped as a possibility for the next Ryder Cup. Every detail from the intricate woodwork on the fireplace, to the unusual room key, to the hidden nooks and crannies of the manor itself sing of old world charm that not many 5 star hotels can replicate. An 8 course tasting menu was on offer on Friday in The Oak Room Restaurant by head chef Mark Donohoe and his team for €75pp. Lit only by candlelight, you will be hard pressed to find a more intimate, romantic setting. The low lighting really adds to the magical atmosphere and we surprised to see how thriving the room was. The layout lends itself perfectly to creating a relaxed, enchanting vibe seen in few dining rooms of such stature. We decided to opt for the wine pairing at €35pp as it included some fantastic organic wines, with 5 glasses in total each. First up was local pickled and roasted beetroots with a dashing of feta cheese and a crunchy toasted pistachio, a light intro for what was to come. The seared scallops that followed had a good consistency and lay on a bed of cauliflower puree with smoked bacon jus, a simple dish but very gratifying. A hearty slow roasted pork belly with fine crackling, onion cream and cider raisin jus was simply mouthwatering. The raisins gave this dish a slightly different element which worked wonderfully. A welcome slow down in service and a delicious glass of Argentinian Malbec was a perfect pairing for the next course, a definite highlight of the menu. Well seasoned pan fried John Dory delicately resting on bed of inviting little prawns with fennel confit, subtle helpful of samphire and a pleasing bouillabaisse sauce. A palate cleanser was much needed after should rich courses and and a dainty pink grapefruit and lemon grass granite were greedily welcomed. Straight on the to the gentleman’s favourite and our server Christian’s recommendation for the best dish of the night, the beef ! 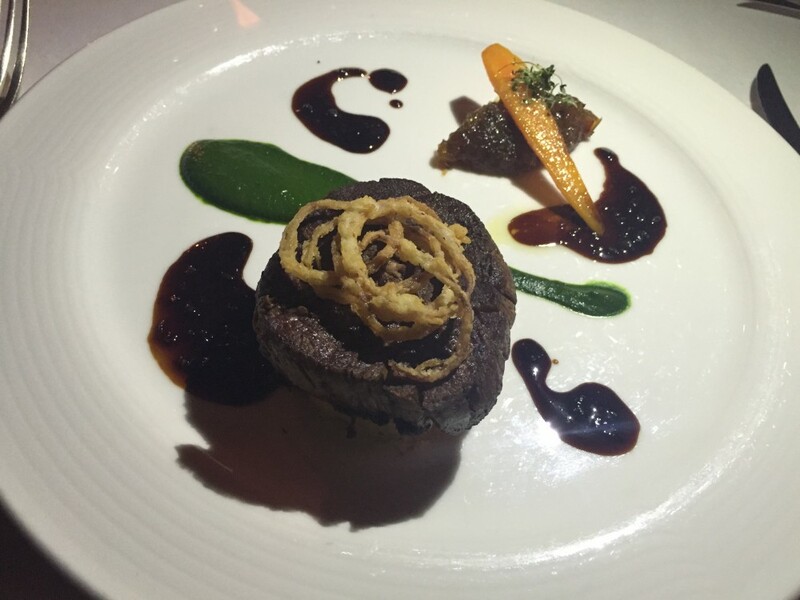 Roasted, cooked medium with a sweet onion jam, crispy shallot and thyme rosti and a rich bordelaise sauce, a definite winner with the boys in the room. One of the things we were quite impressed with was how engaging the staff in the dining room were, from the waiters to the front of house, the ease in which Brian and his team worked their way around the room with a charm and calmness would surprise many who may expect a stuffy experience in this type of venue. Pre dessert was a simple affair of passion fruit cream topped with a frothy basil foam, a light and airy glassful. For the finale a tastefully presented lemon tea cake, manjari chocolate mousse, earl grey crème brûlée and a sinfully zesty lemon curd sorbet. The lemon featuring so prominently worked very well as a refreshing finish to a wonderful meal. It’s hard to believe that up until 1982 this was a family home, such is the transformation from stately home to five star hotel, yet that in part is what makes Adare Manor a truly special culinary destination steeped in history and surrounded by luxury in every corner. This is a enchanting Taste we would highly recommend.